SOVIET propagandists during the cold war were trained in a tactic that their western interlocutors nicknamed “whataboutism”. Any criticism of the Soviet Union (Afghanistan, martial law in Poland, imprisonment of dissidents, censorship) was met with a “What about...” (apartheid South Africa, jailed trade-unionists, the Contras in Nicaragua, and so forth). It is not a bad tactic. Every criticism needs to be put in a historical and geographical context. A country that has solved most of its horrible problems deserves praise, not to be lambasted for those that remain. Similarly, behaviour that may be imperfect by international standards can be quite good for a particular neighbourhood. But it can be overdone—and in the case of Soviet propagandists, it was, and gave rise to subversive jokes For example: A caller to a radio program asks, “What is the average wage of an American manual worker?” A long pause ensues. Then the answer comes: “U nich negrov linchuyut” (“Over there they lynch Negroes”)—a phrase that, by the time of the Soviet collapse, had become a synecdoche for Soviet propaganda as a whole. Whataboutism seemed to have died a natural death at the end of the cold war. But now it seems to be making a comeback. Your columnist took part in a live television conversation with some Russian colleagues last week, supposedly to discuss the bad image of Russia in the British press. It would be possible to make some quite reasonable points from the Russian side: is the media reaction to the Kremlin’s treatment of the British Council selective or disproportionate? Are there angles to this story that nobody is exploring that might put Britain’s stance in a different light? Instead, the viewers were treated to a lively display of whataboutism. How could the West criticise Russia for sabre-rattling, asked the eloquent Aleksei Pushkov, when America and its allies had not just rattled sabres, but actually used them in Iraq. And so on and so forth. It would help if Russia had a word for whataboutism. Literally, it could be kaknaschyotism. A crisp remark about lynching also raises a laugh and makes the point. But the bigger problem is finding a way to discuss Russia’s problems in a way that does not immediately lead to a sterile argument reminiscent of the ponderous tirades of the 1980s. One solution is to use points made by Russian leaders themselves. Guess who said this: “Russia is a country of legal nihilism at the level...that no European country can boast of…Corruption in the official structures has a huge scale”. That sounds as though it came from some opposition politician such as Garry Kasparov—the sort of marginal (or marginalised) figure that Russians often say gains far too much western attention. But the speaker was Dmitri Medvedev (pictured above), successor-designate to Vladimir Putin. Another is for outsiders to show a bit more self-criticism. It is worth noting early on in the discussion some outrageous flaws in American (or British, or German, or French) foreign policy, as well as recent scandals involving corruption and abuse of power. The most powerful western asset during the last cold war was not bigger nukes or higher living standards, but self-criticism. However bad western governments may be, they risk trouble eventually—from the media, the courts or the voters. That is not something that one can say with much confidence about Russia now. The first mentioning of "whataboutism" can apparently be found in Matthew 7:3: "Why do you look at the speck that is in your brother's eye, but do not notice the log that is in your own eye?" This is a question of moral authority. We -- and not all of us are propagandists trained during the cold war -- are questioning your authority to lecture to us. 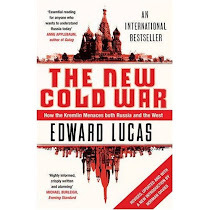 What you are doing, Mr. Lucas, are close to warmongering -- stirring a new conflict to sell a book. Can you sleep at night? How on earth is he "close to warmongering?" You're just trying to derail the conversation with absurdity. In fact, it's a variation on the tactic Lucas was describing in his post. How appropriate.